John Kasich spoke at Villanova yesterday and I had the chance to see him in action. He’s a good retail politician, and his easy nature played well with the partisan crowd. But the fact that he was in Pennsylvania just hours after winning the primary in his native Ohio says everything about why he is very, very unlikely to be the Republican presidential nominee. Pennsylvania doesn’t vote until April 26. Kasich knows there aren’t enough delegates left for him to win the nomination, so he’s picking his spots, trying to accumulate sufficient support to prevent Donald Trump from being nominated on the first ballot, and then . . . with the convention in Cleveland and the home town fans behind him . . . he presents himself as the electable alternative to Trump and Ted Cruz, the two candidates with the most delegates . . . and . . . and . . . It makes little sense as a conventional strategy, but there has been little conventional about this presidential cycle, and that may extend to the convention. In any other year, Kasich would be out of the race by now. This year, he can plot a strategy where he ends the primaries with a weak hand but gains strength over multiple convention ballots. Option A: Rubio wins Florida and Kasich wins Ohio. Both candidates remain in the race and hold Donald Trump below 575 delegates, making it almost impossible for him to accumulate enough delegates to win the nomination on the first ballot and a contested convention ensues. Option B: Rubio loses Florida and Kaisch wins Ohio. Rubio drops out, Kasich stays in, Trump wins Florida and needs to win roughly half the remaining delegates, giving him an even chance of winning the nomination on the first ballot but making the deadlocked convention scenario equally probable. Option C: Rubio loses Florida and Kasich loses Ohio. Rubio drops out, Kaisch drops out, Trump wins Florida and Ohio and only Ted Cruz stands in the way of an almost certain first ballot nomination. By landing on Option B, Republicans kept alive but hardly guaranteed the possibility that Trump will arrive in Cleveland without 1,237 delegates and launched an edgy and anxious discussion among party leaders over what to do next. As this discussion plays out, they find themselves starting to divide into two camps: those whose self-interest leads them to support a Trump nomination and those whose self-interest leads them to oppose it. Some elected Republicans oppose Trump for political reasons, because they fear he will lead them to an epic defeat while redefining the party in his angry image. Movement conservatives oppose him for ideological reasons because he is not grounded in conservative economic, social or foreign policy orthodoxy. As violence escalates at his rallies, there will be good reason to oppose him on moral grounds. But there will be countervailing political pressures to line up behind him so Republicans can win the election, and some Republican officials will not pay a price for their support because their constituents support him. And some will gravitate to Trump because they naturally agree with him. Strategic considerations compound these divisions. Those who want to stop Trump have not coordinated their efforts. Some may decide the only viable option is to throw their support to his strongest opponent Ted Cruz, while others may find that too odious. 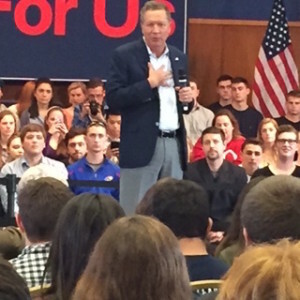 Some will endorse Kasich’s quixotic campaign. Even if #NeverTrump can get its act together, unite at the convention and wear Trump down over multiple ballots, it’s not at all clear how they can unite the party afterwards. In the wake of a potential Trump convention victory, it may be possible to run a conventional conservative on another ballot line, and there likely will be an attractive market for a third candidate, but that, too, is a recipe for an irreparable party split. There was risk in each of the options facing Republicans before the Ides of March. But Option B is fraught with risk and uncertainty. It offers neither the clarity of a contested convention promised by Option A nor the clarity of an inevitable Trump nomination promised by Option C, leaving Republican leaders with more avenues to explore and variables to consider at a time when they are not unified in their approach to the Trump phenomenon and when perhaps the only certainty is that the forces Trump has unleashed are defining the nomination contest and threaten to transform the Republican Party as we have known it. We will be watching this develop in real time over the coming weeks and months.